Density mapping using GIS tools has become relatively easy to do. Thus, for many research practitioners, there has been less of a focus on this methodology for GIS. However, at an application level, density analysis can provide valuable insight into natural and social phenomena. Furthermore, with new forms of data, particularly dynamic “big” data, new avenues of research have opened in density mapping. Density mapping is simply a way to show where points or lines may be concentrated in a given area. Often, such maps utilize interpolation methods to estimate, across a given surface, where concentration of a given feature might be (e.g., population). Kernel density measures are sometimes used to smooth point estimates to create a surface of density estimates in a given area. 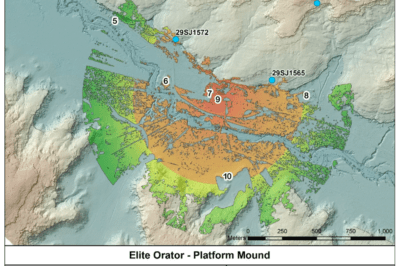 Common tools such as ArcGIS and QGIS have point density analyses that provide a quantitative value and visual display capability that shows concentration of points. For line density, the concentration of linear feature in a neighborhood is used, similar to points. One example and application of density mapping includes its use for tornado monitoring and analysis. For example, inverse-distance-weighted counts of points where tornadoes have landed have been used in a gridded area or cells to then estimate densities of where tornadoes have touched down. This can then be used to estimate paths and decay functions are used to determine where tornadoes may go before they begin to dissipate. In urban analysis, density estimates have been derived from satellite data, such as SAR images, that help provide the level of built area that can then be taken as part of a density function to then estimate how built is a given area and how that changes relative to other scenes from satellite imagery. For social science data, density mapping can be useful for modeling or understanding crime data statistics in a given region. 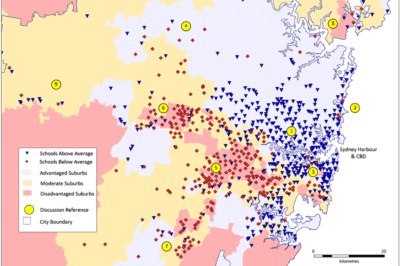 Point patterns and density maps have been used in Bayesian or predictive statistical methods that then estimate where future crime might be located based on previous point locations of crimes. Density mapping using kernel density measures have also been applied to studying unhealthy behavior of men in public places in Sri Lanka. As unhealthy behavior is often associated with group activities, where these activities cluster around areas such as schools, places of worship, estate areas, or other areas, then mapping these gatherings can demonstrate how public space facilitate or encourage unhealthy behavior. It was shown that low population density areas with open areas for gathering had the highest rates of unhealthy behavior where men gathered more regularly. 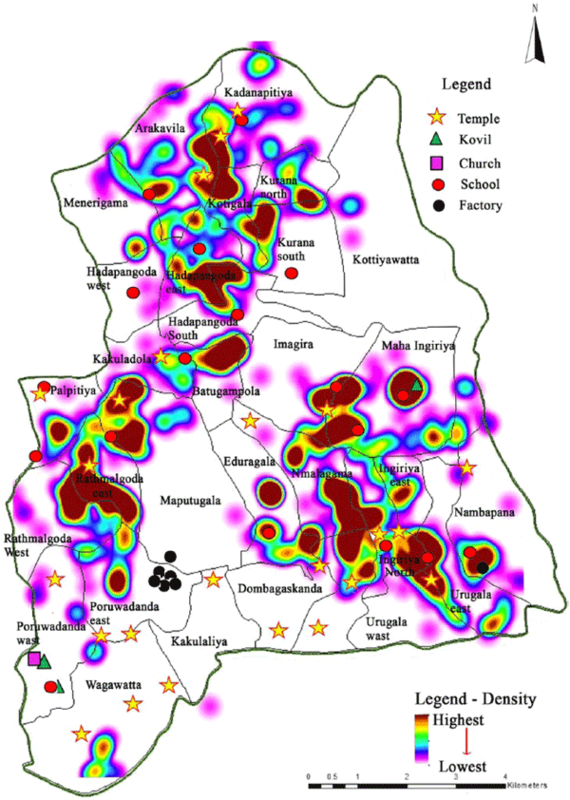 Map showing kernel density of current smoking and some important places in Ingiriya. Source: Padmaka Silva, 2015. Recent applications of density mapping using “big data” have also been applied, such as using geolocated Twitter data to find densities of given phenomenon. Population distribution, as one example, can mapped by taking Twitter data and determining where, at a given time, population clustered or was more densely located. Mobile data, in general, have given a new area where density mapping is now increasingly applied to, as social content enables dynamic density maps to be more feasible than in the past. 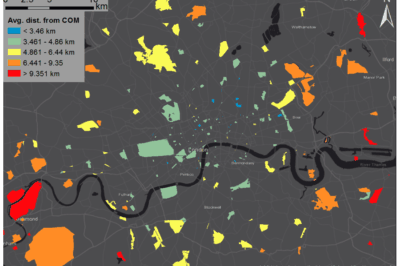 Dynamic density urban maps could, for example, be created that show long-term, short-term, or current trends using smoothing algorithms such as locally weighted scatterplot smoothing on geolocated data. Maps showing the results of a two-month aggregation of geo-located tweets over the full extent of Java (top) and a view focused on Jakarta (bottom). Maps: Patel et. al, 2017). Density mapping has been used for some time by geographers. Traditional methods continue to provide utility to those working in the social and environmental sciences, particularly in applied research to problems such as disaster prediction and crime mapping. However, the area where we see relatively new growth is in the use of mobile data that has enabled more dynamic density mapping to be created. This has also opened a new area of research for many geographers. For more on the use of density mapping for mapping tornados, see: Deng, Y., Wallace, B., Maassen, D. & Werner, J. (2016) A Few GIS Clarifications on Tornado Density Mapping. Journal of Applied Meteorology and Climatology. [Online] 55 (2), 283–296. Available from: doi:10.1175/JAMC-D-15-0141.1. For more on density mapping using satellite data, see: Susaki, J., Kajimoto, M. & Kishimoto, M. (2014) Urban density mapping of global megacities from polarimetric SAR images. Remote Sensing of Environment. [Online] 155, 334–348. Available from: doi:10.1016/j.rse.2014.09.006. For more on the statistical forecasting method, see: Fitterer, J., Nelson, T.A. & Nathoo, F. (2015) Predictive crime mapping. Police Practice and Research. [Online] 16 (2), 121–135. Available from: doi:10.1080/15614263.2014.972618. For more on the study demonstrating unhealthy behavior and public gatherings using density mapping functions, see: Silva, J.P. (2016) Mapping Unhealthy Behavior Among Economically Active Men Using GIS in Suburban and Rural Areas of Sri Lanka. Asia Pacific Journal of Public Health. [Online] 28 (1_suppl), 10S–16S. Available from: doi:10.1177/1010539515611723. For more on using geolocated Twitter data, see: Patel, N.N., Stevens, F.R., Huang, Z., Gaughan, A.E., et al. (2017) Improving Large Area Population Mapping Using Geotweet Densities: Improving Large Area Population Mapping Using Geotweet Densities. Transactions in GIS. [Online] 21 (2), 317–331. Available from: doi:10.1111/tgis.12214. For more on dynamic density mapping using mobile devices, see: Zhu, X. & Guo, D. (2017) Urban event detection with big data of taxi OD trips: A time series decomposition approach: ZHU and GUO. Transactions in GIS. [Online] 21 (3), 560–574. Available from: doi:10.1111/tgis.12288. What is the Difference Between a Heat Map and a Hot Spot Map?